Here's a recent proposal on voting in NJ out of the NJ Assembly. It suggests there's more to be done on aiding voting in the state. There doesn't seem to be any mention of curbing voter fraud, the abuse of Vote-by-Mail, non-residents of NJ or non-citizens voting. In fact, this is such an open voting system as proposed, one has to wonder if you can't register and vote from your living room - in Bucharest as a fine citizen of say Romania. The national trend among some appears to encourage voting by anyone and everyone. Allowing illegal voting however nullifies the value of your vote. Voter fraud is certainly outdated but there's no measure proposed whatsoever to stop it. We know a little about voter fraud here in Hoboken. Some call it a tradition. (TRENTON) – Democratic legislative leadership on Monday announced sweeping overhauls of New Jersey’s outdated voting rights laws – including plans to allow early voting, online and automatic voter registration, same-day registration, increased accessibility and protections and an end to wasteful special elections. The leaders said they would introduce ‘The Democracy Act’ on Monday, with the plan being to get it to the governor’s desk by month’s end. The leaders noted New Jersey is 39th in the United States in the percentage of eligible voters who are registered at 64.3 percent, compared to 82.8 percent for the top state. And, New Jersey is 39th in the country on average voter turnout at 54.5 percent, compared to the top state at 73.3 percent. Among the organizations participating in the effort are the: New Jersey Working Families Alliance, ACLU, Latino Action Network and the League of Women Voters. “The right to vote is the great equalizer, but that equality only becomes real when we all have equal access to the ballot box,” said Analilia Mejia, the executive director of the Working Families Alliance. “We commend the leaders in the legislature for advancing policies that will help ensure New Jersey's democracy is by and for the people, and we will work together with legislators to mobilize grassroots support for these common sense proposals and ensure that they become the law." The bill establishes “The Democracy Act” to revise various voter registration and voting procedures. Specifically, the bill establishes early voting, online voter registration, voting day registration and allows for the pre-registration of 17-year-olds. The bill expands various language accessibility provisions by lowering the population threshold that triggers requirements for the publication of election notices and materials in languages other than English. The bill also makes various changes to current procedures for voting by mail, military and overseas voting under the Overseas Residents Absentee Voting Law, and filling vacancies in the United States Senate and House of Representatives. Finally, the bill establishes an Office of Accessible Elections in the Division of Elections in the Department of State, codifies a 1982 federal consent decree that prohibits certain actions by persons and political parties concerning elections, lowers the standard for challenging election voter fraud in court and requires the periodic reporting on incidents of voter fraud during the conduct of an election. · Early voting - Voters would have the ability to vote early at convenient times and locations, including extended and weekend hours and numerous locations throughout the state. This would occur during a two-week window up through the Sunday before the Tuesday election to allow voter books to be updated. · Universal voter registration - Modeled after a successful Oregon law, anyone who gets a driver's license or state ID card with the DMV would automatically be registered to vote unless they affirmatively opt-out. · Same-Day voter registration - Any voter in New Jersey would be able to register and vote at the same time through provisional ballot, in general elections only. · Eliminate special elections to fill vacancies - New Jersey taxpayers would not be subject to expensive special elections on irregular days to fill vacancies for office such as the $24 million U.S. Senate election on a Wednesday in October 2013. Senate seats that become vacant more than 70 days before a general election would be filled at that election. All others would be filled at the next year's general election. And while the governor would retain the right to pick an interim senator in the event of a vacancy, the choice would have to be from the same political party as the senator who had held the seat. · Expand access for military and overseas voters - Members of the military and those overseas would be able to take advantage of technology such as the Internet, fax machines, or other means to make voting convenient and secure. · Allow for online voter registration - Require the Secretary of State to establish a secure Internet website to allow eligible voters to register to vote using an online voter registration form. · Expand “vote-by mail” - Voters would be able to choose to vote by mail.. Voters who have applied for a ballot but not yet returned it would be able to vote at the polls without excuse on Election Day. And all vote-by-mail would be done at no cost to the individual voter. · Prohibit harassment at the polls - An existing consent decree with the U.S. Department of Justice prohibiting harassment of voters at the polls ends in 2017. The decree would be put into law. · Ensure access for people with disabilities - All places for voting, early voting, in-person registration, mail-in registration and online registration would be accessible to those with disabilities. · Pre-registration of Young Voters – Allow a person who is 17 years of age to register to vote, and may vote at the next election occurring on or after the person’s 18th birthday. · Ensure access for non-English speakers - In a state with as much diversity as New Jersey, as many eligible New Jerseyans as possible would be able to vote and register to vote in a language they understand. 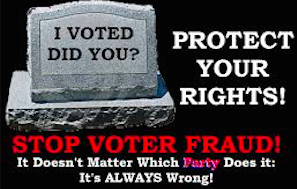 · Strengthen voter fraud laws – It would change New Jersey law to allow for voter fraud challenges when reasonable evidence exists that illegal votes have been received, or legal votes rejected at the polls sufficient to change the result.